For many, the kitchen is the heart of the home. And no matter how many Picassos you may have in the living room, the kitchen is always the place everyone congregates during a party. Here are a few helpful tips for organizing your kitchen that can inspire a more enjoyable cooking and entertaining environment. Go through each kitchen cabinet, drawer and counter and pull out things that you rarely use, duplicate items or those that are broken. Relocate the rarely used items (like that ice cream maker) to a special location in deeper kitchen cabinet storage. Donate items you never use. If you’re a Prometheus Neighbor, you can bring any unwanted items to your Go Green for Spring cleanup location in April for recycling or eco-friendly disposal. Pull out everything from your spice rack and check the expiration dates. Although spices don’t go “bad,” they lose their flavor once they’re opened. Whole spices will last for up to two years, while ground spices start to go south after six months. Try to find them a new home away from your stove and any light. Making items easy to find will only make cooking more fun. You may already be corralling your plastic bags, foil, and wrap together in one drawer, or putting the pots and pans in a cabinet by the stove. Consider curating collections of items, like a tea drawer for all the fancy varieties you collect – particularly useful and impressive when company calls. Your counters should only host items you use daily. Put everything else in a cabinet so you maximize your workspace. Has your counter become a dumping ground for mails, keys and cell phones? Keep counter surfaces clear of clutter by investing in a simple command base to hang on your wall or refrigerator to house calendars, phones, and to-do lists. You’ve seen them – those food containers in the catalogs that make cabinets look so tidy. Whether they’re plastic, glass, wicker, or mesh wire – now is the time to measure your shelves and buy a few for your space. 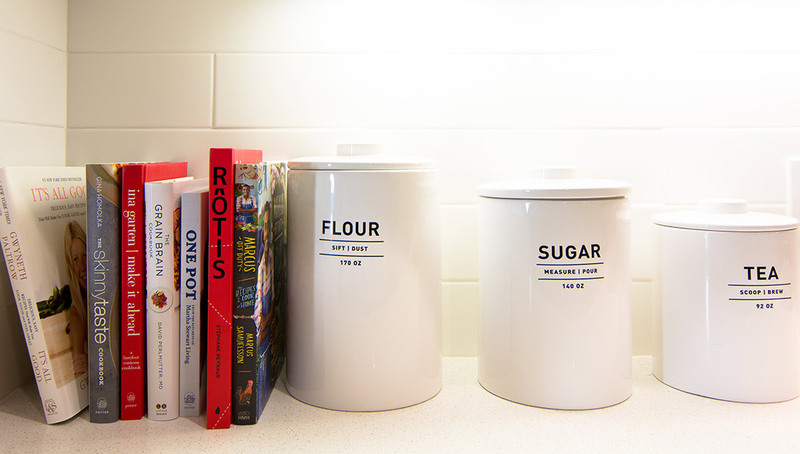 Not only can they store like-minded products together for easy access, they look nice, too. You can also place chalkboard stickers on the containers to keep track of your rotating inventory. To maximize your cupboard’s space, try using a small serving tray, or wire rack as a shelf divider between layers of cups. A multi-tiered lazy susan is another simple way to free up countertops or shelf space in the pantry and refrigerator – perfect for oils, vinegars, sticky jars, vitamins, or ingredients that traditionally disappear in the back of your fridge. Make use of vertical space by adding adhesive hooks to the inside of a kitchen cabinet or pantry door to hold dishtowels, aprons, measuring cups, bags, or just about anything that can hang. It may seem counterproductive to your apartment organization techniques, but the reality is that no one is perfect. Rather than fight it, keep one and organize it with drawer dividers to house pens, rubber bands, and miscellaneous tools. Now that the great kitchen purge of 2017 is complete, invite some friends over for a meal. Or maybe just order delivery – you’ve earned it.